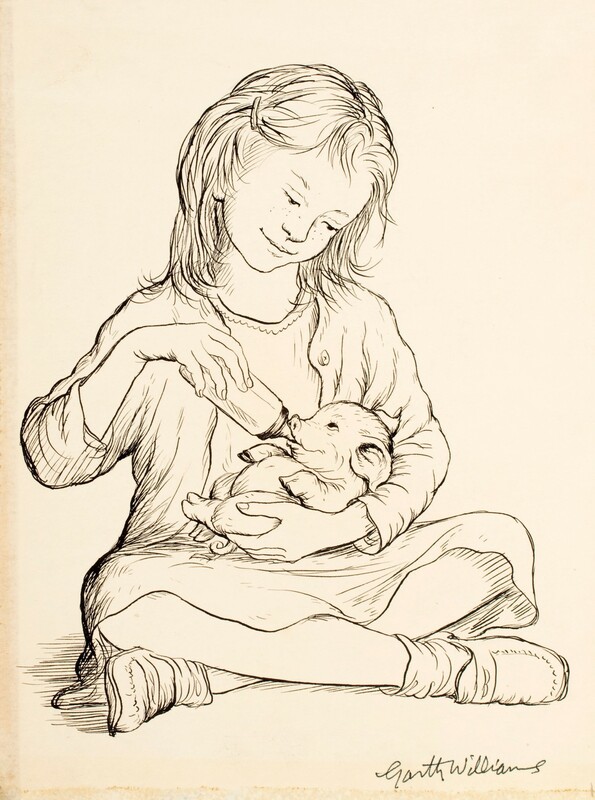 The original graphite-and-ink drawing of Charlotte holding Wilbur while they look up at Charlotte’s web made by Garth Williams in 1952 sold at auction yesterday for $155,350. Heritage Auctions’ pre-sale estimate was $20,000 to $30,000. The final sale price is a record for any of Williams’ art. Included in the lot was an ink drawing of a web and 2 watercolors of the cover design. E.B. 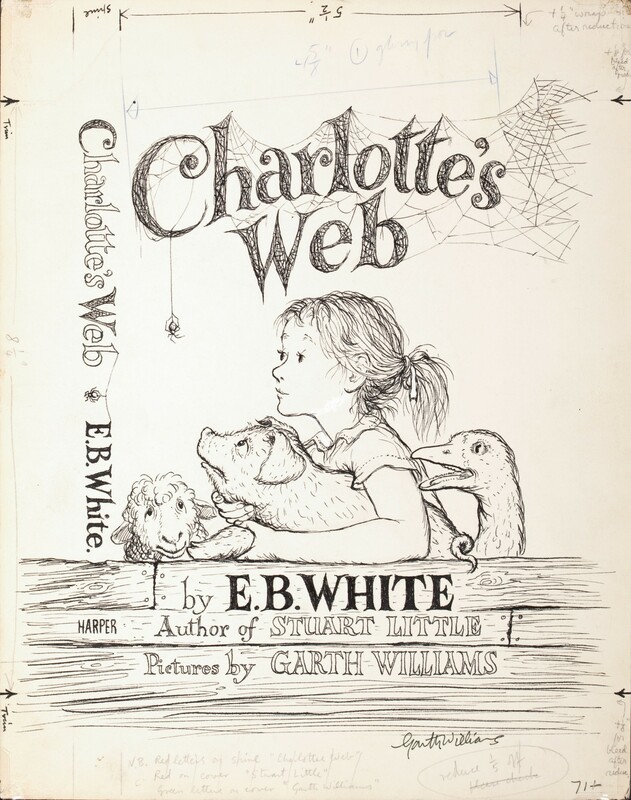 White’s book Charlotte’s Web was published in 1952 with Garth Williams’ soon to be iconic cover image. The book has been translated into 35 languages and was listed by Publishers Weekly in 2000 as the best-selling children’s paperback of all time. Williams’ drawing has remained the cover art throughout the entire 58 years of its publication run. Its endurance makes it the most-printed cover illustration of any book by an American author. The tenderly rendered cover art is a sublime thing. The fine-lined 11×14 image features farmgirl Fern Arable clutching Wilbur the saved-from-slaughter pig, as the literate arachnid Charlotte spins her magic above the livestock. On the original can also be seen handwritten production marks. Fiona, the eldest of Williams’s five daughters, was said to be his model for Fern Arable. When Williams first starting doing illustrations in the 1940s, he would send the original drawings to the publisher, they would get used and then sent back. He kept his returned art during his lifetime. After his death, the family carefully preserved his oeuvre, securing it in a bank vault. 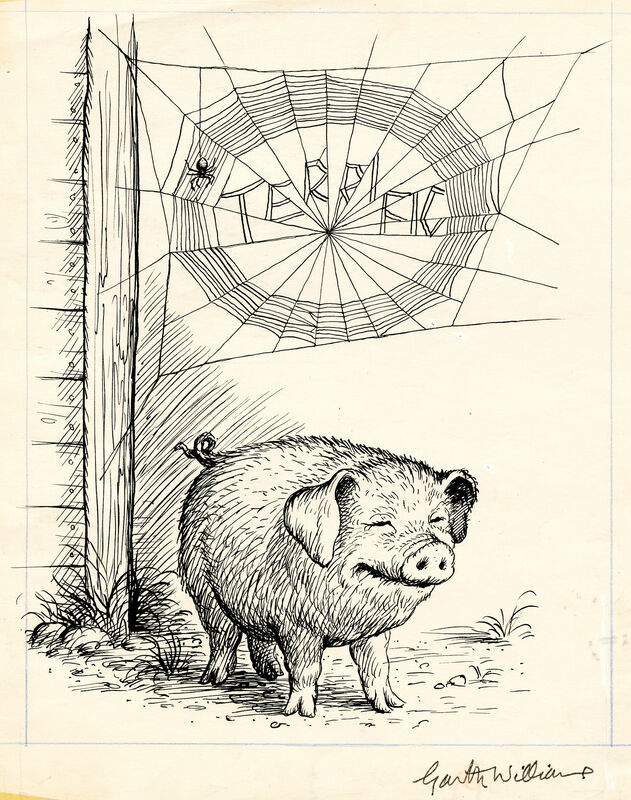 Yesterday they put 42 original Garth Williams illustrations for Charlotte’s Web on the auction block. 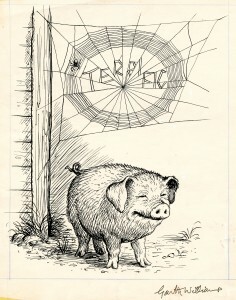 The illustration of Wilbur looking triumphant under the web where Charlotte has written “TERRIFIC” sold for $95,600. My personal favorite since I was a girl because of how irresistibly adorably sweet Wilbur looks, the one where Fern is bottle-feeding Wilbur as a piglet, sold for $19,120. The final combined total for all of Williams’ 42 pieces was $780,245. This entry was posted on Saturday, October 16th, 2010 at 10:38 PM	and is filed under Books, Modern(ish). You can follow any responses to this entry through the RSS 2.0 feed. You can skip to the end and leave a response. Pinging is currently not allowed. Hey, I like your blog! This is exactly the kind of stuff I like to read. Random history is awesome. Thank you! I agree, random history is great fun. 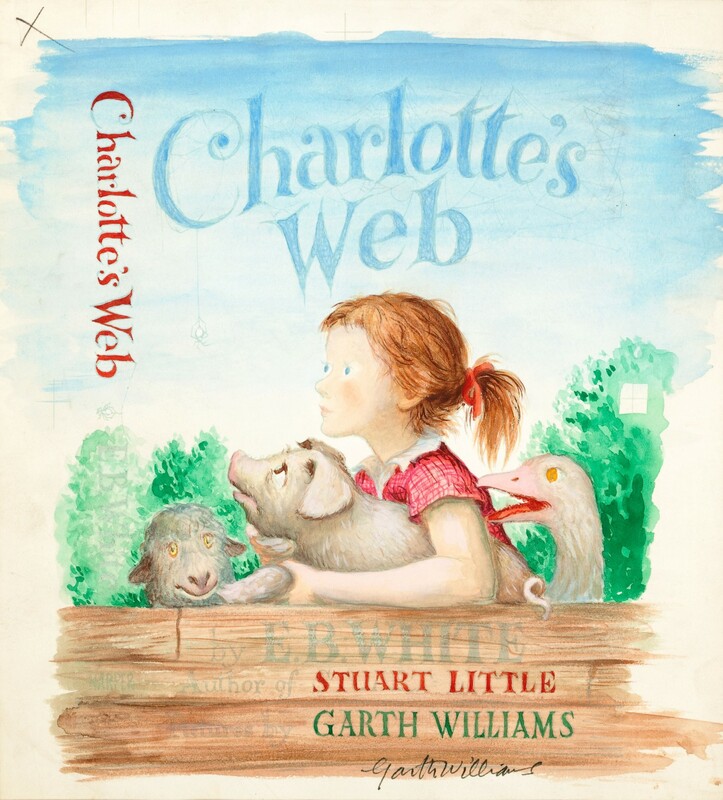 A slight correction: you state the art depicts, “Charlotte holding Wilbur while they look up at Charlotte’s web” but it is actually Fern holding Wilbur while they look up at Charlotte’s web.